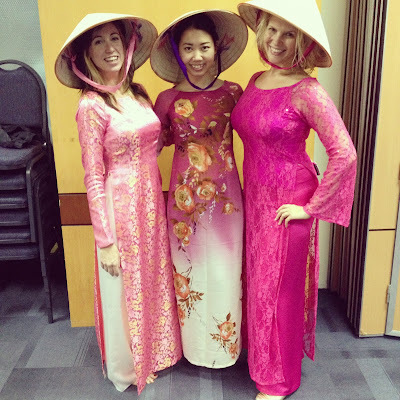 The ao dai (Vietnamese: áo dài) is a Vietnamese national costume, now most commonly worn by women. In its current form, it is a tight-fitting silk tunic worn over pantaloons. The word is pronounced [ʔǎːw zâːj] in the North and [ʔǎːw jâːj] in the South. Áo classifies the item as a piece of clothing. Dài means "long". From the twentieth century onwards Vietnamese people have also worn clothing that is popular internationally. The Áo dài was briefly banned after the fall of Saigon but made a resurgence. Now it is worn in white by high school girls in Vietnam. It is also worn by receptionists and secretaries. Styles differ in northern and southern Vietnam. The current formal national dress is the áo dài for women, suits or áo the for men. People in Vietnam wear cotton clothes. Styles differ in northern and southern Vietnam. Many people wear sandals made of old tire rubber(North). (South) Many men and women wear western styled clothing. Some women still wear the traditional au dai. In most rural areas women wear loose white-shirts with skirts. Men in rural areas wear western clothes too. 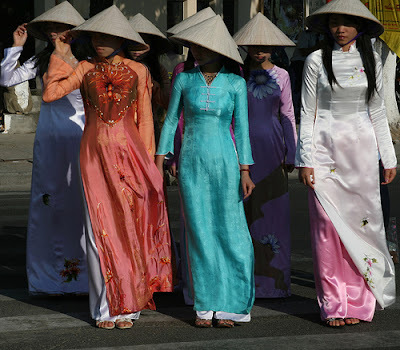 The Vietnamese typically wear lightweight clothing. Rural women wear loose-fitting dark-pants and blouses that are often embroideredin brilliant colors. Conical nats called non la shield their faces from the sun. 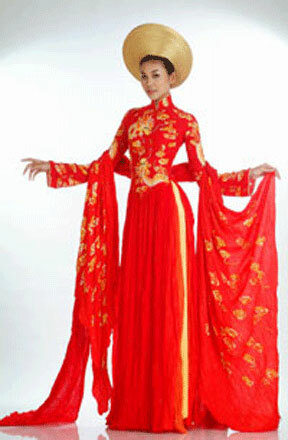 In the cities, many girls and women wear the traditional au dai, a long tunic worn with loose-fitting pants. However, a growing number of urban women wear dresses and shirts. Rural and working class men typically wear simple shirts and trousers. City men generally wear Western-style clothing. The Áo t? thân or “4-part dress” is one such example of an ancient dress widely worn by commoner women, along with the Áo y?m bodice which accompanied it. Peasants across the country also gradually came to wear silk pajama-like costumes, known as “Áo cánh” in the north and Áo bà ba in the south. The headgear of peasants often included a plain piece of cloth wrapped around the head (generally called Khan d?ng), or the stereotypical Nón lá (conical hat). For footwear peasants would often go barefoot whereas sandals and shoes were reserved for the aristocracy and royalty.